High workplace turnover, fractured loyalties, rising tensions between managers and employees — these are nothing new. Employment law expert Jathan Janove delivers his proven process for creating a star profile and provides information, examples and real-life stories on how organizations have used this tool in hiring and promotion, new employee orientation, succession planning and performance appraisal. At the heart of Janove’s system of employee management is the Star Profile: “a concise, action-oriented word picture capturing a manager’s or an executive’s vision of success for a particular job, department or work function.” Janove centers his philosophy of management on the distillation of a succinct, vivid vision of each position within a company and then uses the Star Profile as the guiding light for creating a better system. 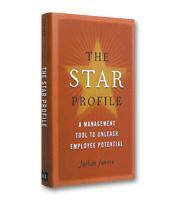 The Star Profile first provides readers with a detailed look at the concepts behind Janove’s system and its applications, which range from hiring new employees to bringing disgruntled employees in line with the company vision to enabling a company to part ways gracefully with an employee who refuses to meet expectations. Janove then spends several chapters walking his readers through how to implement the Star Profile in their own businesses, taking a step-by-step approach to first creating a Star Profile, then refining it, and finally bringing all of a company’s Star Profiles together so that they work in conjunction to create an effective, productive and satisfied constellation of colleagues, working together to achieve the organization’s aims. The Star Profile certainly presents a kinder, gentler view of managing employees, even delving into the value of CEOs and supervisors creating their own star profiles in order to bring themselves more in line with the company’s needs and vision. Janove advocates a two-way system of feedback, where employees not only receive praise and criticism from their higher-ups, but also are invited to give feedback to their supervisors. While reading The Star Profile, it is easy to get excited about the potential of this tool for creating effective, fulfilling, mutually respectful employee-manager relationships.